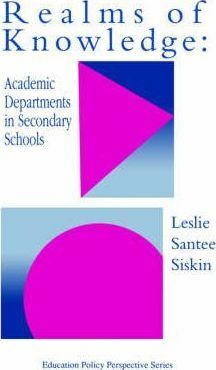 This study examines academic departments as a context for teaching in the secondary school. lt explores why teachers find departments to be crucial to the high school setting. In all three schools studied and in all four subjects English, Maths, Science and Social Science teachers - even those who felt isolated in their classrooms - located their sense of professional identity, practice and community in their departments. Departments are seen as boundaries for dividing the school; centres of social interaction; a micro political decision-making forum; as a subject knowledge category. Those concerns are important at this time as various attacks are being made on school structures and subject and administration fragmentation - in these cases subjects are seen as obstacles to change. To subject groups they are viewed as potential vehicles to carry and confirm the message. The Invisibility of Departments; Historical Background - From Realm to Realms; The Departmental Plan; The New Organisation of the High School; Subject Divisions Specialist Divisions; The Study; Context and Design of the Study; The Schools; Oak Valley High School; Rancho High School; Highlander High School; Boundaries and Barriers; Boundary Strengths; Breaking Barriers at Rancho; Drawing Boundaries - Communication Cliques; Social Worlds Looking for Community; The Individuals Involved; Departments as Social Worlds Different Kinds of Community; Power and Politics; Norms of Silence and Political Language; Privileged Position of Academic Subjects; Relative Privilege Among Academic Subejcts; Micro-politics Inside Departments; How the Subject Matters Subject Cultures; Subject Differences; Social Studies; English; Math; Science; Underlining Differences; Departmental Differences; implications for Policy.